IBC's newest generation barcode reader for connecting to PCs and controllers. The Smart Slot Jx is user programmable and firmware upgradeable, allowing new features to be added in the field. The Smart Slot Jx is a decoded barcode swipe reader designed to be used in any application which requires the swiping of a barcode from a card, such as employee IDs, temporary badges, and licenses. Since the decoding is internal to the Smart Slot J, no wedge reader or external device is required. These readers are available in a wide array of industry standard interfaces, are programmable, and may be ordered with a variety of options, such as leds, alphanumeric displays, sense inputs, and relays. 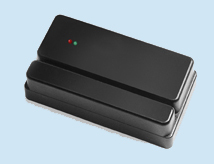 Perfect for use in Access Control and Time and Attendance applications. The Smart Slot Jx is firmware upgradeable, and can read and process Kronos, Cac, Usid, and Dbids barcodes. To read 2D and QR codes see the Qscan reader.